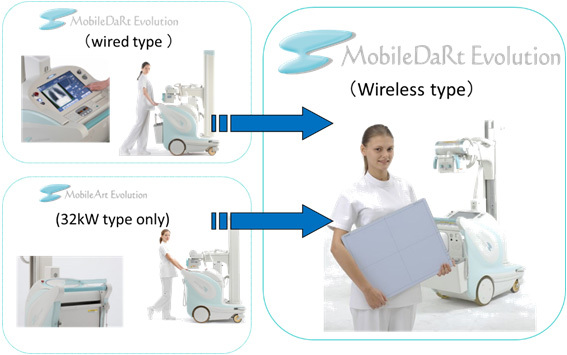 "For the MobileArt Evolution (32kW) and MobileDaRt Evolution (Tethered)"
It's been 10 years since Shimadzu created the DR Mobile market and today, DR panel technology has advanced so that a wireless FPD is an everyday common detector in the radiology department. 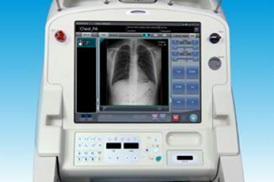 Shimadzu Medical Systems USA now offers an upgrade and refresh program for your Mobile X-ray unit, transforming your dated system to a state-of-the-art DR portable that makes your department more efficient and offers higher safety and comfort to both your patients and technologists! Microsoft announced that Windows XP extended support officially ended April 8, 2014. If you are a user of a Shimadzu MobileDaRt Evolution with Windows XP, this does not mean that the system will not work properly, however, potential security risks may exist. If you have systems with Windows "XP" and a tethered FPD and are looking for a solution to eliminate both XP operating software as well as the tethered FPD, then our refresh solutions are a good fit for you and your department. If you a user of a Shimadzu MobileArt Evolution 32kW unit, you can also upgrade to a full DR system. You can purchase either a standard "new" PC with Windows 7 or the latest NE software or upgrade with a premium "Wireless" FPD package for your MobileDaRt Evolution system. There is no doubt that using DR mobiles help in reducing patient discomfort and stress, while increasing efficient workflow. The Shimadzu DR mobile’s ability to obtain a high quality image in just a few seconds, while the patient rests comfortably in his room without the need to be transported is invaluable. 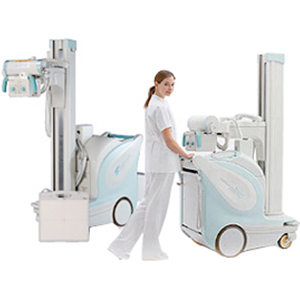 If you have a Shimadzu MobileArt 32kW, we believe upgrading your analog X-ray unit to become an advanced DR system using the wireless detector and 17 inch large monitor insures your capital equipment’s longevity in a demanding environment. Additionally, with either system you own, you can select valuable refresh options that offer longer life main batteries, a bright white LED collimator, drive handle sensor replacements, raised driving handlebars for a more comfortable drive, wide viewing monitor and brand new cover sets for an up to date modern look. The new silent motor and enhanced unit rigidity further reduce driving noise. To avoid accidents when maneuvering the MobileArt Evolution around crowded medical facilities, an alarm can be used while in motion to alert others to the presence of the unit. Press the inch-mover buttons on the front of the collimator to inch the unit backwards or forwards, providing easy and precise positioning in confined spaces. As a safety measure, any force applied to the drive handle during inch-mover operations stops movement of the unit. 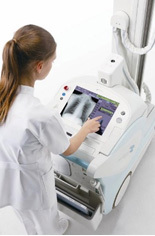 In addition, an interlock prevents X-ray irradiation while the MobileArt Evolution is in motion. Shimadzu's acclaimed power-assist function allows the operator to drive the MobileArt Evolution naturally, simply by applying light pressure to the drive handle. The unit moves just as the operator desires, achieving excellent handling when navigating around the wards. 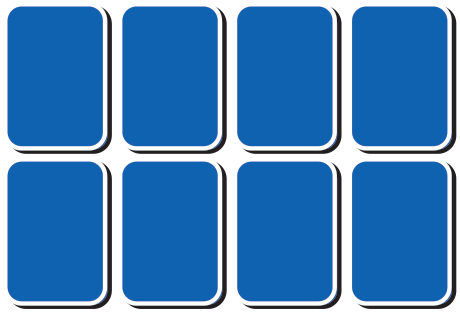 The MobileArt Evolution provides unrivalled turining and maneuverability. The EFX version adopted LEDs as the light source to indicate the irradiation field. This reduces power consumption while improving brightness levels and durability. During installation, the drive handle can be set at 4 cm (1.57 inch), 6 cm (2.36 inch), or 9 cm (3.54 inch) above the standard height. This makes ward radiography tasks more comfortable for tall operators. Setting a password for each user enables keyless use of the system. The Key-less Entry enables to turn on the system by 4 digits key command input without any actual key, which is useful to share the units by several staffs. Upgrade to a flat panel detector (FPD) to display images just two seconds after exposure. This allows any information required for the next procedure to be obtained quickly in the emergency room.